The Maricopa High School girls’ basketball team finished second in the Scorpion Shootout tournament at Desert Edge High School in Goodyear over the weekend. The Rams won their first three games in dominant fashion before running into Arizona Interscholastic Association Division I powerhouse Xavier College Prep in the tournament’s championship game. The Gators of Xavier took advantage of Maricopa’s size disadvantage and won the tournament with a 69-48 victory. 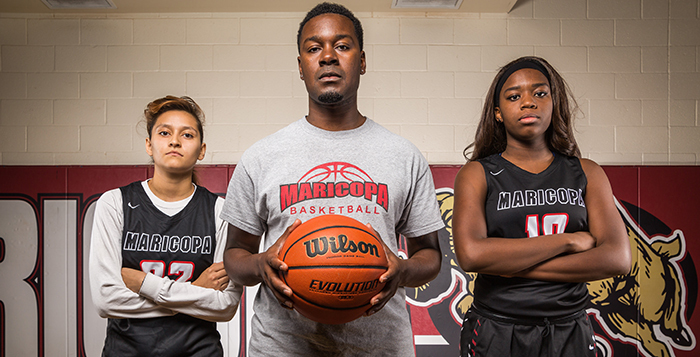 Against the competition within Maricopa’s Division II, the Rams dominated. Maricopa started the tournament with a 52-17 win over Sabino High School out of Tucson Friday morning and followed it up with a 74-59 win over Tucson Magnet High School Friday night. Coming off of a dominant first day of the tournament, the Rams beat tournament host Desert Edge 47-27 Saturday morning to advance to the tournament championship Saturday night. Maricopa will take on the Casa Grande High School Cougars on the road tonight before hosting their first home game of the season on Thursday at 7 p.m. against Buena High School (Sierra Vista). Also Thursday, senior guard Danae Ruiz is expected to sign a letter of intent to play for Embry-Riddle Aeronautical University.